I’m always being asked to come up with ideas that combine wedding flowers and candles and I hope you will like this unique centerpiece. 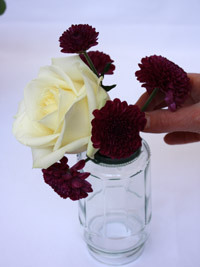 This step-by-step tutorial shows you how to add wedding flowers to my wine glass and candle wedding centerpiece. 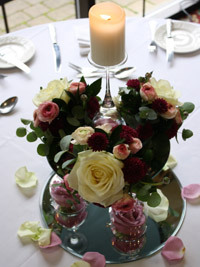 When combining wedding flowers and candles one thing you need to consider is how close the candle is to the flowers. After all you don’t want to singe or set fire to your beautiful wedding flowers. You can see in this design how the candle is placed well above the flowers so there is no chance of them getting any heat damage. 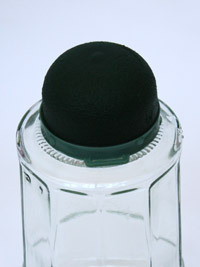 3 ‘Mini Deco Oasis’ foam bumps, this brand has a sticking pad on the base, which you can use to secure them on to the mirror. 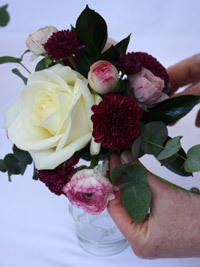 4 roses and a variety of smaller flowers to fit with your wedding theme, I used chrysanthemums and ranunculus. A small amount of foliage, I’m using eucalyptus leaves. Soak all 3 mini deco foam bumps by placing them up side down in a bowl of water. Cut and add the rose to each foam bump. Then place the other flowers around the rose. Fill in the gaps between the flowers with your foliage so that you can’t see the foam. Peel off the film backing and stick the bump to the mirror, be careful to position them at equal spaces around your mirror. 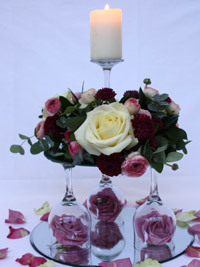 Pull the petals off your remaining rose and scatter around the base of the arrangement.